"Remove-Paint.com | Paint: Powder Coat Remover | to Remove Paint & Remove Powder"
Remove-Paint.com | Paint: Powder Coat Remover | to | Remove | Paint | Powder Paint Removers to Remove: Paint, Remove: Varnish and Remove: Powder Coating: Powder Coat. Remove Paint: Powder from Aluminum leaving Aluminum in Original Condition. Place your free Finishing Listing on our #1 Finishing and Powder Coating Online Finishing Directory & Forum. 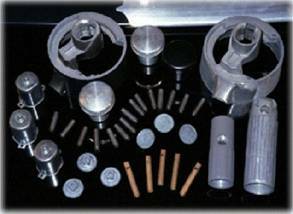 Find Custom Coaters: Powder Coaters: Paint Finishers: Metal Finishers: Finishing Equipment: Finishing Suppliers: Finishing Events and Powder Coating Online Finishing Resources. Remove Powder Coating & Remove Paint: Recycle Paint Finishing-Rework by Stripping Powder Coating with MILES Chemical Solutions Powder Coating Stripper Solutions, Obtain a Second Chance at First pass, (zero) 0-defect Quality. Remove Paint: Remove Powder Coat, Strip Powder Coating from hooks, racks and fixtures with our Powder Coating Removal Process. We offer Eco friendly paint strippers & Green-Powder Coat stripping solutions to remove paint & strip powder coating. Safely remove paint and remove powder coating from aluminum, remove coatings from zinc, magnesium, brass, stainless, ferrous and plated metal substrates with our Nonhazardous Powder Coating Stripper Products. Order a 1-gallon or 5-gallon sample container at $34.85/gallon, plus-shipping $20.00 UPS in the US , to test at your facility. Begin to reclaim coating rework and clean hooks today! MILES#8612 ECO-POWDER STRIP-RTU is a ready to use (add no-water), eco-friendly: green, multi-metal safe paint strip solution formulated to dissolve cured coatings including: powder coating, (e-coating-only when heated) and wet-applied cured coatings from aluminum, zinc, magnesium, brass, stainless steel and steel substrates. Used in conjunction with #8635 Evaporation Inhibitor at 5% concentration. for use with MILES #8608, MILES #8612, MILES #8626. Completely Water Soluble and Free Rinsing. Recommended Use: Begin utilizing at any time on any caustic bath. Use MILES #8635 at 3%-5% by strip tank volume to maintain a 1/4"inch floating blanket that seals off evaporation of costly chemicals and water, there-by reducing replenishment. to maintain optimum pH range (11.0-12.0) in MILES #8612 bath. 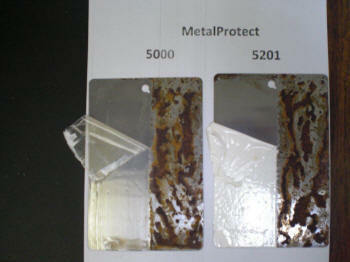 Also use MILES #8605 at 5% by strip tank volume, with other alkaline stripping solutions to temporarily inhibit oxidation and attack on all metal surfaces. Order a 1-gallon or 5-gallon sample container at $34.85/gallon, plus-shipping, to test at your facility. 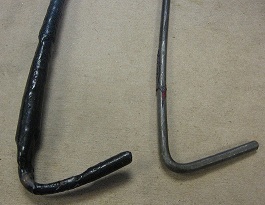 Begin to reclaim coating rework and clean hooks today! MILES#8648 AMBIENT POWDER STRIP-THIN is a paint strip solution formulated to under-cut: de-laminate and remove Powder Coating from Aluminum and Steel paint rework. #8648 can be used to strip Aluminum Wheels and e-coat racks: e-coat paint rework when HEATED. Use at Room Temperature, Contains no-hazardous Methylene Chloride. MILES#8659 a thickened brush-on Gel used at Room Temperature. Use 5% by strip tank volume of our new and improved MILES #8635 Evaporation Inhibitor or 2-layers of polypropylene tank floats on the tank surface to inhibit evaporation, reduce replenishment requirements and extend stripping solution bath life. OxyStrip eco-friendly stripping solution, an alternative that actually works better than the current technologies offered as safe strip products. OxyStrip is a non-methylene chloride product, based on oxygen to accelerate coating removal performance. OxyStrip and is available by visiting: http://www.mileschemicalsolutions.com/Oxy_Strip_1.htm on the web. The product will remove all types of house paint and varnish from wood and metal surfaces and is non-regulated for shipping and non-hazardous, it has little to no-apparent odor, is thickened to hold to vertical surfaces and will not evaporate as fast as many other products available in today’s market place. 4) Heat solution to 150F. 5) Soak wheels for 1.5 hours, while maintaining 150 Degrees F. Note: Utilize a tank lid and polypropylene floating evaporation inhibitor balls to reduce solution loss and replenishment requirements and extend to chemical bath life. 6) Rinse the Aluminum Wheels with water and a pressure washer to remove paint: powder and excess coating from recessed areas on the aluminum wheel surface. 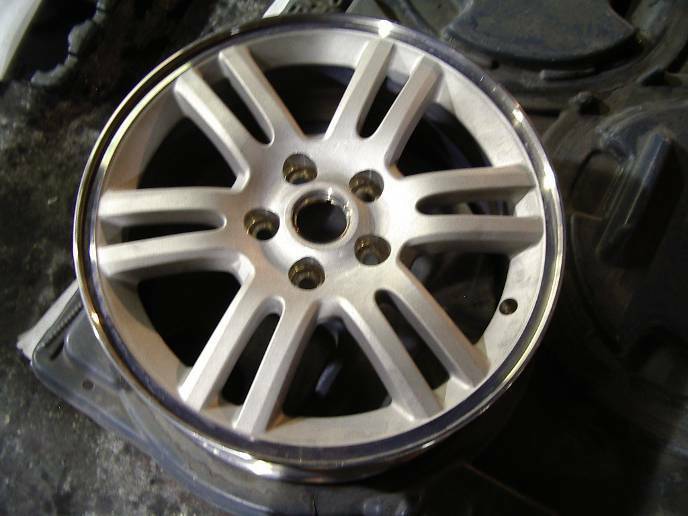 After rinsing, the aluminum alloy wheels have a pre-paint, original bright surface appearance and are ready to return to the powder coating process. Consumers and Individuals may utilize thickened MILES#8649 room- temperature stripper to strip a single set of aluminum wheels. Miles has recently developed Environmentally Friendly Paint Strippers, Low in VOC and Low Temperature <205F., Proprietary Technologies and Methods to salvage and recycle paint rework, avoiding the necessity of parts disposal. Miles Paint Strippers are formulated to strip paint, strip powder coatings and remove e-coating from most surfaces including: Aluminum, Brass, Copper, Zinc, Steel and Plastics. These Proprietary Paint Stripper Products were engineered by Miles to provide the Paint, Powder Coating and E-coating Finishing Industry with Environmentally Friendly Paint Stripping Products and economically feasible methods to recycle paint rework. Miles Technologies allow the Finishing Industry to reach "0-Tolorance" Paint Quality without having to reprocess sanded and paint-repaired parts that may have broken the substrate surface. Sanding paint defects from parts may adversely affect the pretreatment, the substrate original surface quality and may even result in final paint quality failure. History has shown evidence of inter-coat paint adhesion failure on sanded and refinished painted parts. Miles Paint Stripping Processes utilize an insulated, heated immersion tank with a lid, a mixer for agitation, a filter to remove paint laden sludge and exhausted ventilation. The paint rework parts are immersed in a solution of 50% Miles chemistries and 50% water added at the Finishers facility. The 50% water and Miles Paint Stripper Products solution is heated to a range of 130F-200F, depending on the substrate, the coating type and the Miles Paint Stripping Products utilized. The process time to completely strip the cured coating from the substrate is usually 10 minutes with E-coat Removal to less than an 1-hour paint stripping powder coatings. The second stage is a fresh water immersion rinse, usually followed by a manual or automated pressure water final rinse. The parts are then air or oven dried and reprocessed through paint with original surface quality. Miles Chemical Solutions founder, Samuel L. Miles, was the first individual in the United States to invent, formulate and patent methods to strip paint and remove paint coatings from aluminum and galvanized substrates with a soap-based paint stripper, 99% free of VOC. Original Article From "Paint and Powder"
Miles has been hard at work over the past several years trying to find an environmentally friendly method for stripping paint or powder from Non-Ferrous substrates. After working unsuccessfully with conventional technologies, he recently discovered the perfect stripping material – Soap. To be exact, Miles Chemical Solutions (Detroit) is working with a compound that contains surfactant, high temperature synthetic soap. The material is also developed with Triethanolamine, a very hygroscopic, viscous liquid used in manufacturing surfactants and emulsions. Miles says the stripping material is 99% free of VOC's. Typical stripping materials for Non-Ferrous objects contain VOC's, such as N-methyl 2-pyrrolidone and Glycol Ethers. Others based on Silicates, tend to stick to Non-Ferrous substrates, making them difficult to repaint. Miles says he worked extensively with solvents and silicates in attempt to find a stripping material that was both environmentally friendly and an effective stripping compound, but was unsuccessful. He even investigated high-temperature polymers, but ran into all-to-familiar problems. “The beauty of this stripping technology is that it doesn’t hurt the surface or shine of the nonferrous substrate,” he adds. 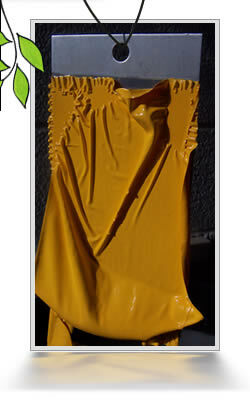 The stripping material is best used in a vented hot-strip tank with adequate agitation. The material is poured directly into the tank with no water or solvent additive needed. “This material is non-hazardous and can be easily disposed of,” Miles says. 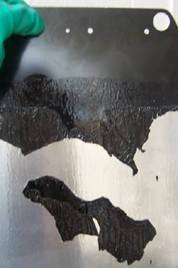 The Patented Technology has shown the ability to remove paint on Aluminum, Brass, Zinc, PC-Plastic parts, Ferrous and Non-Ferrous substrates. "Miles says that he hopes to provide Powder Coating Strippers to Custom Powder Coaters Worldwide"
Paint Removal Products, Paint Stripping Service/Coating Removal Service. Miles Chemical Solutions Offers Aluminum Powder Coating Strippers to Remove Powder Coating from Aluminum, Aluminum Powder Coating Removal Products to Remove Powder Coat from Aluminum: Powder Coating Stripper, Powder Coat Strippers, Aluminum Paint Stripper, Aluminum Powder Coating Stripper, Powder Coating Removal, Powder Coating Directory, Finishing Online Directory, E-Coating Paint Removers to Remove Paint: Aluminum Stripper, Paint Stripping: Paint Stripping Products: Paint Stripping Services, Paint Removal Services, Paint Removal Contractors: Coatings Removal Services and more...Remove-Paint.com | Paint: Powder Coat Remover | to | Remove | Paint | Powder.